Once again I let some bananas go past their prime. That is why we have muffins today. Muffins with chocolate chips and walnuts, and they smell amazing right now. I am trying really hard to ignore the smell, but I can see them baking in the oven right this moment and I am losing this battle. Just took the muffins out of the oven and they look beautiful. Hurry and cool off, please. This is a simple recipe. You have wet ingredients and dry ingredients, and then you combine the two together. Voila, you now have a wonderful muffin batter. Combine all wet ingredients and stir until well combined. Stir in mix-ins into dry ingredients. Stir until mix-ins are covered with the flour mixture. This helps the mix-ins from sinking to the bottom of the muffins. Add wet ingredients to the dry and fold until it is well mixed. Spoon into greased wells of a muffin tin. 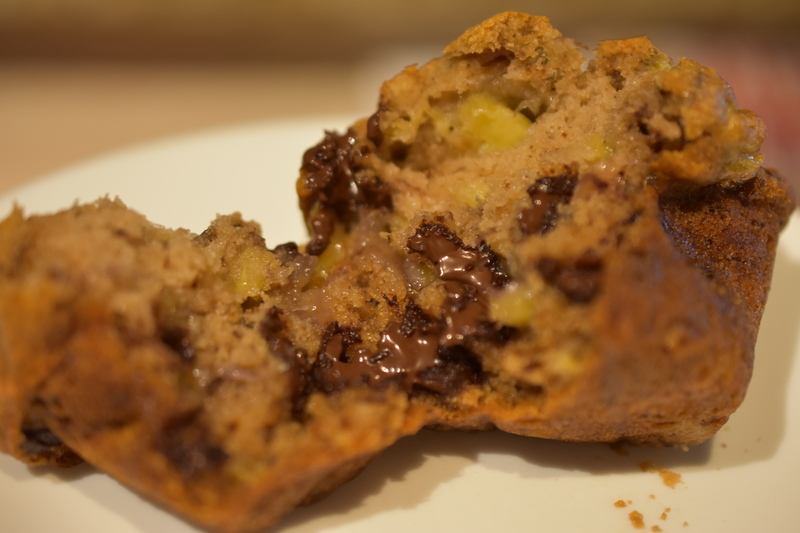 Remove from oven and let muffin rest for about 10 minutes before removing from muffin tin. Continue to cool on wire rack, if you can. That did not happen in my house. There ares good. Thanks for stopping by. Thank you Jacque Rose. Thanks for stopping by. i need to try this. Anything banana will be a hit in my house. I hope you enjoy them as much as we do. Thanks for stopping by. Thank you. It is a favorite. Thanks for stopping by.